THE PENTAGON – The Navy has more questions than answers on how it will use unmanned warships in the future, but it knows now is the time to get unmanned surface vehicles into the water and start learning, the Navy’s top requirements officer told USNI News. 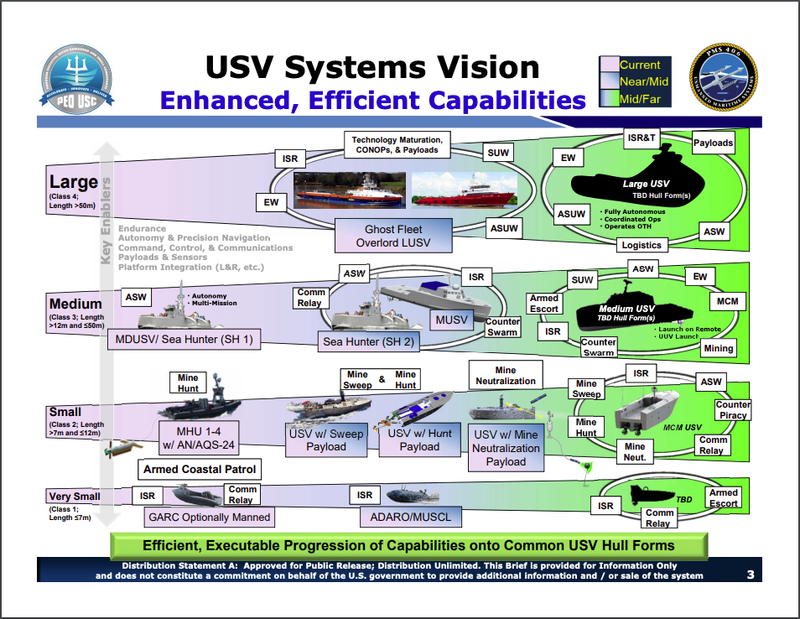 The service is so sure that it needs USVs for its future operations that it is pouring $2.7 billion into researching and buying 10 large USVs over the next five years, as part of an overall plan to buy 232 unmanned surface, underwater and aerial vehicles of all sizes in the next five years. But the Navy shocked many when it said it would decommission an aircraft carrier 25 years early so that it could use part of the money to fund construction of and experimentation with those large USVs. Asked why the time was right for such a bold move, given how little the Navy knows of USVs, Vice Adm. Bill Merz, the deputy chief of naval operations for warfare systems (OPNAV N9) told USNI News last week that the lack of knowledge is exactly why the Navy needed to make this investment right away. Merz said the Navy knows some of what it wants unmanned surface vessels to contribute to the force. Small USVs, like Textron’s Common Unmanned Surface Vessel (CUSV), will contribute to mine countermeasures missions. 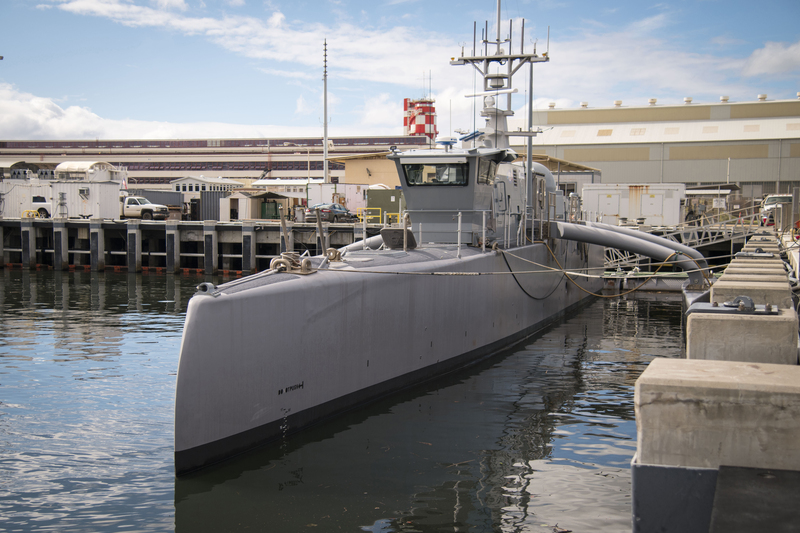 Medium USVs, akin in size to the Sea Hunter USV created by DARPA, will serve as sensors for the fleet. And large USVs, a similar size to smaller manned ships like the Offshore Support Vessel, will carry weapons. On the large USV, Merz said the Pentagon’s Strategic Capabilities Office (SCO) has already purchased two with its own funding. The Navy’s first two LUSVs, set to be bought in Fiscal Year 2020 under the budget proposal released last month, would be the same design or a very similar design to the two SCO vehicles, he said. Beginning in 2021, the Navy would work closely with industry to understand what’s possible and what kind of design and capabilities to pursue, in a requirements evaluation team process similar to the ones used for the frigate, Large Surface Combatant and others. After a year or two of seeing the LUSVs in the water, the Navy could go to industry and say, “now you know what we want it to do, we’ve run these things around, you’ve all seen them, you kinda know what we’re after; give us some opinions. And we’ll start working with industry on what the rest of them will look like,” Merz said. Merz made clear that – for now, at least – these unmanned vessels are not being considered battle force ships and would not replace any battle force ships. But that could change in the future, if efforts to build and integrate USVs into the fleet are successful. “They may be (battle force ships) someday, but we have to get through all those [technical and policy questions] I was explaining before we get to the point of calling them ships,” Merz said.“What happens if you come through a storm and you had four and now you only have three? And that one was full of very valuable payloads. Where did it go? Who has it? Is it on the ocean floor? And then the whole policy questions about are we going to let the fleet use these? There are very active discussions, but we don’t have the direction yet, so until we come through all that, then we can start the discussion on, which ships might these eventually replace?